JOIN US in Park City for four days of programming (full program coming soon). On January 25th from 10am to noon the Digital Storytelling Lab @Columbia will be running a special open design session. This session kicks off our 3 month R&D effort. If you’ll be in Park City and would like to join us please see application below. We have room for 30 people. Please note programming runs daily from the 23rd to the 26th at the IndieGoGo Lounge at 427 Main Street and is open to all on a first come first serve basis. Filmmakers have often led the way in creating compelling storytelling blending art and science. The history of cinema is a history of innovation in storytelling and craft. 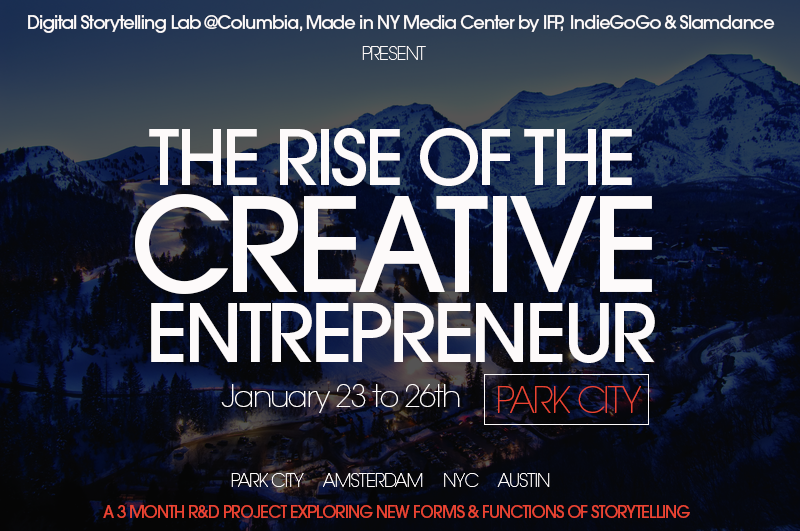 It is in that spirit that Slamdance, IndieGoGo, the Digital Storytelling Lab @Columbia and the Made in NY Media Center by IFP are teaming up to explore, research and reflect on the impact and potential of story and code. Before, during and after the festival, a number of questions will be examined and expanded upon. 1. How can we harness technology to evoke empathy and emotion in ethical ways, while at the same time enabling an intuitive, invisible and fluid storytelling experience for an audience? 2. How can we help story to drive technology as opposed to technology determining how stories are made, told and shared? 3. How can we build funding structures that are adaptive to an ever-changing digital landscape? 4. How can we build a sustainable industry that values the work of creatives and is transparent, fair and innovative? What other questions should we be exploring? SUBMIT your questions and have them added to the 3 month R&D project. Building upon the Filmmaker Summit held at Slamdance in 2010, Story Driven Innovation is an initiative consisting of a series of talks, demos and collaborative design sessions during the opening weekend of the festival to learn from filmmakers and technologists who are taking leadership in transforming the way we finance, make and distribute films. The work started in Park City will be continued beyond the festival. In March, the results of the research will be released in the form of a whitepaper / report. At the same time we will grant the first Story Innovation Award to a person, project or company that is pushing story and code forward in 2015. Together a diverse group of storytellers, producers, technologists, data researchers, creatives and entrepreneurs will gather to explore the opportunities, pain points and realities of an ever-shifting digital landscape. Insights from the session, kickoff a 3-month research project that will stage collaborative sessions in the United States and Europe. The goal of the think and do session is to explore some of the most pressing issues facing those working in and around the entertainment industry. This special session has space for 30 participants. Come and be part of an R&D project who’s findings will be published by Columbia University and Filmmaker Magazine.